I had to swallow a big dose of my own medicine today, and it didn’t taste very good. It’s easy to dole out advice to other singles when life is more-or-less put together! My life has basically been turned upside-down the past 6 months. The result of which has left me searching for a new spiritual home. Needless to say, it’s been a bit of an adjustment. Given the demographics of my northside Chicago neighborhood, it would be easy to find a church with a large percentage of single people – even if that meant a little longer commute to Mass on Sunday morning. It would be even easier for me to continuously “shop around” – hopping from one church to the next, week after week, without ever making a commitment to one particular church community. Consistency and accountability are important to me, so church-hopping was not an option. I had a few basic criteria (good preaching, decent music), but more than anything I wanted to find a church community close to home. So, for the time being, I’ve landed at a large family friendly neighborhood parish. It’s a short drive (or a long walk) impeded only by multiple one-way streets. There is a sense of community and diversity that I find incredibly attractive. The pastor is outgoing and personable; he remembers names and goes out of his way to introduce people to one another. It’s not perfect (no place is), but it is a place that I find myself drawn to week after week. Lately, however, I have found myself repeating that often-voiced single person’s complaint: My parish only cares about married couples and families. I never imagined that I would use that phrase to describe my feelings about the church! I have to admit though, there are a LOT of families at my new parish, and they are blessed with a very active religious education program and a large Catholic school. As I look around the church on Sunday, I know that I am not the only single person. Yet despite all that is good about this place, I regularly resist the urge to grab a red magic marker and cross off every announcement in the bulletin that is specifically designed for families and circle the one or two options that are available for singles. It happened again today, and this time I cried. 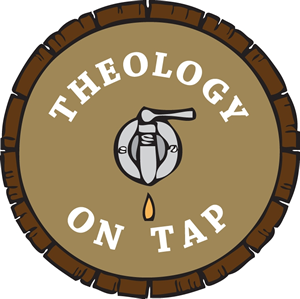 I noticed an announcement about an upcoming church fundraiser at a local pub (with the pastor and school principal as guest bartenders, no less!). Finally, a chance to meet people in a fun social setting! I couldn’t wait to get home and put the date on my calendar. Once at home, I opened the bulletin again and noticed a detail I hadn’t previously seen. RSVPs are to be turned in to the school office, and the response form also requested “your child’s homeroom number”. Immediately, it became clear to me that this was a social event for parents, and my heart sank. Sure, I could email the contact person and ask if non-parents are welcome. It would not be difficult for me walk an RSVP form over to the school office, and I could simply mark “N/A” in that spot inquiring about whether or not I have a child in the school. Perhaps I’m being foolish for overthinking this, and maybe it’s clear to everyone else that this event is open to all parishoners. But as a new-comer, it’s really not clear WHO is invited. What I’m realizing, for the first time, is that community is not automatic. Showing up for Mass is not enough. Meeting people takes a lot of work, and truly getting to know a person takes consistent effort. Furthermore, the fruits of those labors are not immediate. I’ve exchanged friendly good-morning greetings with dozens of people over the past 4 months. But knowing names does not constitute community, and seeing the same person three weeks in a row does not make you friends. So, it’s time to swallow some of my own medicine on the subject. Years ago, my wise older sister and her family moved to a new city, and she developed 3 simple criteria in their search for a new parish – prayer, participation, and presence. I think the same criteria applies to singles looking to find their place in a family-friendly parish. 1. PRAYER: Is this a place where I can pray well and feel connected to God? Do I experience God’s presence in the physical space, as well as during the liturgical celebration? I have to remind myself that church is not about what I get out of it – this isn’t a concert! It’s not about “feeling good” when I leave. 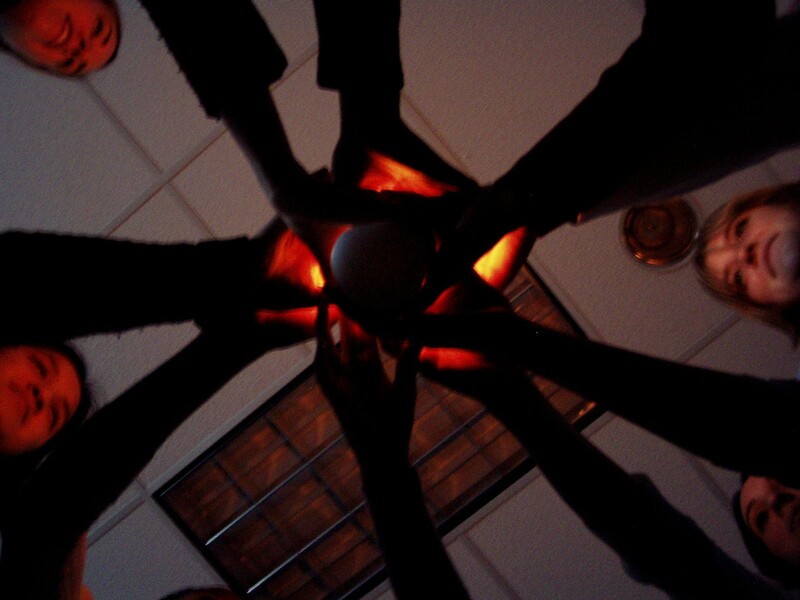 The purpose of our communal prayer is to give glory and praise to God! We praise God by our singing, by our active participation, by our attentive listening, by greeting one another with a sign of hospitality upon entering, by sharing with one another a sign of Christ’s peace, by receiving Christ reverently in the Eucharist. We praise God in all these ways. 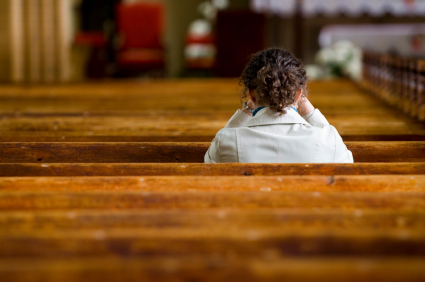 So, as a single person, how do I praise God when I am constantly distracted by the chatter of small children? Well, I certainly have a much greater appreciation for family dynamics after spending time with my siblings and their kids! I’ve been the doting aunt standing at the back of church with a two-year-old who cannot sit still. And it’s given me a tremendous amount of compassion for parents who are raising their children in the church. Perhaps my greatest gift as a single person is to welcome, acknowledge, and empower the presence of families – especially those for whom Sunday morning can be a struggle. Finally, I have to admit that I much prefer extended periods of silent prayer – which is not always possible at a busy parish on Sunday morning. So, I experiment with different mass times. I take advantage of time spent at home reading the Sunday scriptures. Being in a large city, I know the secret hiding places where I can find a quiet prayer space during the week. Sunday morning liturgy isn’t about me (see comments above); it’s about “us” being the body of Christ together. The more I attend to my need for quiet time and personal prayer, the better I am able to be joyfully present and appreciative of our entire church family on Sunday. 2. PARTICIPATION: Does the church welcome participation in the liturgy, especially from women, children, lay people, families, single people, young adults, new comers, etc.? Are there opportunities for fellowship, catechesis, faith-sharing, social justice programs, etc.? Is this a place where I could see myself participating in some way? I gave a presentation for singles at a parish several years ago. During the Q&A, a woman raised her hand and insisted “there is nothing here for singles.” I was grateful that the Director of Faith Formation was in the room. She quickly pointed out that most events were open to the entire parish and very few things were exclusively for couples. Sometimes, it is really a matter of perception. I find that I need to be brutally honest about what I notice. As I glance through the Sunday bulletin, the options for families are quickly apparent – religious education for children, a monthly family mass, marriage retreats, a spotlight on one of the teachers. Sometimes my bitterness makes me blind, and I miss what’s right there in front of me – a book club, bible study, women’s group, food pantry volunteers, garden club, music ministry, a pilgrimage, retreat programs, etc.. If you find yourself saying there is “nothing” here for singles, look again. Or better yet, look for opportunities to create something for singles. 3. PRESENCE: Am I called from here to be the presence of Christ for others? Are there opportunities for outreach to the community, the poor, and the wider church? Show up! Do something that requires no commitment other than to be present. Donuts and coffee after mass is a great example. It doesn’t get any easier than this! Grab a cup of coffee, say hello to people, and trust that God is at work in bringing you together. Building community takes time, but you have to take the first step. Volunteer! The possibilities are endless: the food pantry, the choir, bible study, visiting the homebound. Meet people, ask their names, ask if they live in the area, and ask how long they’ve been members here. In turn, share something about yourself and give people a chance to get to know YOU. Remember, you belong here! The body of Christ includes all of us! That’s true for men, women, children, teens, families, single parents, widows, divorced, vowed religious, gay, straight, people of all racial and ethnic backgrounds, the uber-pious, the biker gang members (yes, there was a tattooed motorcycle gang at church a few weeks ago! ), believers, beginners, the hopeful, the doubtful, the lost and the found, all of us! Each person brings a unique set of gifts, life experiences, ways of prayer … and single people in particular, at whatever age and stage in life, bring a unique vantage point. I guess the primary reason I’m committed to staying here is because I can answer YES to those three questions. Yes, I pray well there – it is a beautiful space, where I continue to feel drawn in. Yes, I participate there – and I’m especially looking forward to the garden club convening again this spring! Yes, I’m called forth to be Christ’s presence from there. The “church” I experience in their home is messy, imperfect, filled with laughter, and sometimes interrupted by a toddler announcing she needs to use the potty. My best friend’s willingness to listen, ask tough questions, and her ability to accept me for who I am is unsurpassed! We don’t expect each other to be perfect, and we manage to bring out the best in each other even on our worst days. The time I spend with my friends reminds me that the presence of Christ which I experience on Sunday in this beautiful, imperfect, holy place called “church” truly does prepare me for being and experiencing the presence of Christ in the world. It has long been my dream to write a book that encourages Christians to discover joy and purpose in the single years. 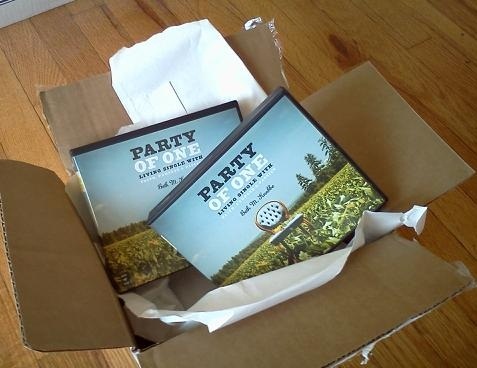 With the insights of many friends and the help of a great editorial team, I am excited to introduce Party of One: Living Single with Faith, Purpose, and Passion! Please join me in celebrating the release of a new book and the start of a new chapter in my life. Even if you are not in the greater-Chicago area for these inaugural events, I still hope you will pick up a copy of the book for yourself or for a friend! I love to travel, too. So please let me know if you’d like to host a book signing in your area. Join other young adults for this candid, hopeful, and optimistic look at how to enjoy being single! Discover spiritual tools for living a full and abundant single life. Come for one or both nights. 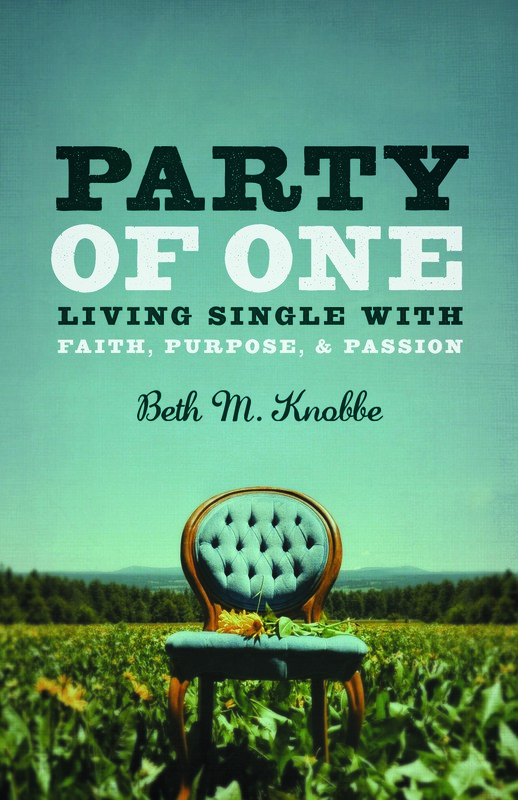 Party of One: Living Single with Faith, Purpose, and Passion takes a candid and hopeful look at how to enjoy being single! Using the insights of scripture and ordinary people, Beth Knobbe shows us that the single life can be a place of abundance and joy. Party of One addresses the fears singles face, the assumptions people make, and the questions singles ask themselves. Each chapter also includes practical and spiritual advice for finding happiness and contentment during the single years. Available in paperback or Kindle Edition, with an audio book forthcoming in 2012.